Flight Engineer Serena Auñón-Chancellor mixes samples for the Microgravity Investigation of Cement Solidification (MICS) experiment and installs them into the Multi-use Variable-g Platform. The research utilizes the microgravity environment aboard the International Space Station to investigate the complex process of cement solidification. Results may impact possible construction processes and designs for space habitats on the surface of the Moon and Mars. Credit: NASA. Meanwhile, in the middle of the spacewalk and departure preparations, the International Space Station residents today also explored how living in space impacts the human muscle system. Flight Engineer Sergey Prokopyev will work outside the space station Dec. 11 to inspect the Soyuz MS-09 crew vessel. The Russian spacewalker will join veteran cosmonaut Oleg Kononenko for a scheduled 6-hour inspection on the outside of the spaceship that will return the Expedition 57 crew home Dec. 19 U.S. time. Prokopyev checked the Orlan spacesuits today that he and Kononenko will wear during the eighth spacewalk of the year. Expedition 57 Commander Alexander Gerst and Flight Engineer Serena Auñón-Chancellor assisted Prokopyev checking the Russian spacesuits for leaks. Gerst and Auñón-Chancellor then moved on to a study that has been ongoing aboard the orbital lab since September of 2017 observing how muscles adapt to outer space. The duo set up the Columbus lab module for research operations and scanned their head and foot muscles with an ultrasound device. The data may help doctors improve fitness in space and develop treatments for muscle and aging problems on Earth. Back on Earth, on opposite sides of the globe, a pair of rockets are getting ready to send a new crew and more science and supplies to the space station. Russia's Soyuz MS-11 spacecraft will launch Kononenko and fellow crew members Anne McClain and David Saint-Jacques from Kazakhstan to the station on Monday at 6:31 a.m. EST. The following day at 1:38 p.m. in Florida, the SpaceX Dragon will blast off to the station to deliver more than 5,600 pounds of cargo to resupply the station residents. JEM Airlock (JEMAL) Depressurization: The JEM Airlock was depressurized in preparation for the transfer of the NanoRacks External Platform Inserts (NREP) back to the Exposed Facility Unit (EFU) 4 location. The NREP was brought inside ISS earlier this week so the crew could exchange the sortie 3 payload for the sortie 4 payload. Each NREP sortie on the JEM Exposed Facility is approximately 6 months in duration. The NREP represents the first external commercial research capability for testing in support of scientific investigations, sensors, and electronic components in space. 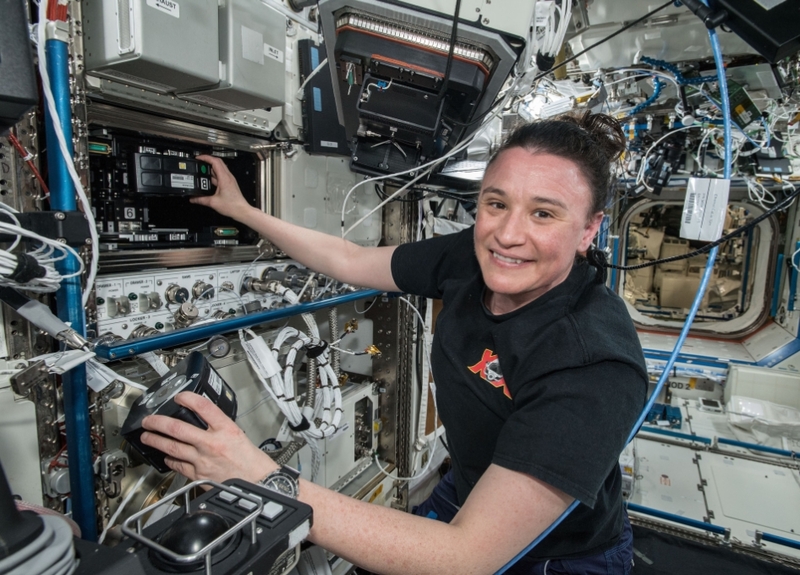 Muscle Tone in Space (Myotones): A crewmember performed blood collection, skin marking, Myotones device measurements, and ultrasound measurements in support of the Myotones investigation. The Myotones investigation observes the biochemical properties of muscles during long-term exposure to the spaceflight environment. Results from this investigation are expected to provide insight into principles of human resting muscle tone, which could lead to the development of new strategies for alternative treatments for rehabilitation both on Earth and for future space missions. Minus Eighty-Degree Laboratory Freezer for ISS (MELFI2): Late in the day on Wednesday, MELFI2 stopped sending health and status and was not recoverable via a power cycle, and was subsequently powered down. Science samples were successfully transferred to another MELFI with no issues reported. During the initial troubleshooting today, MELFI2 powered back into a nominal state. The team will continue to monitor MELFI2 and it's unlikely we'll consider putting any science samples into this unit until sometime after SpaceX-16 arrival. MELFI is a cold storage unit that maintains experiment samples at temperatures as low as -95°C throughout a mission. There are three MELFI units on ISS. Sokol Suit Leak Checks: In preparation for their return to earth on December 20, all three crew members donned their Russian Sokol launch and entry suits in order to perform standard leak checks. All leak checks were completed successfully. Locating EVA hardware and tools.